Our industry is constantly changing, and 2016 was no exception. Among the many different techniques and types of learning solutions for adults, what once were emerging trends have become integrated into our offerings, while new trends have been generated that offer enormous potential. At SweetRush, well, we love to share. It’s important to spread our knowledge as best we can to our peers, friends, and colleagues in the industry. It’s in our DNA and part of our culture, and we write learning articles and create conference and webinar presentations with the intention of inspiring you—and ourselves!—to new levels of engagement and effectiveness. To begin the year motivated and inspired, we want to share with you our top 16 learning articles published on our website, on elearningindustry.com, in Technology Enabled Learning Excellence, and in Training Industry Magazine. Gamification, mobile learning, talent management, and eLearning were all important topics for which we shared best practices, tips, and some secrets to success! Here’s a summary of our top 16 learning articles. Choose your favorites, click through, and enjoy! Our core business is the development of custom content and the creation of engaging, effective, award-winning solutions to our clients’ business challenges. Here are some of the learning articles and posts we published this year related to custom content. If you need financial and human resources to develop the learning solutions that you need, follow these six recommendations from Erin Krebs, our Director of Client Solutions. Great insights! The market has exploded with authoring tools designed for mobile learning solutions. Solution Architect Lauren Granahan breaks down the key considerations for choosing the right tool for your needs. A roundup of our best tips, tricks, and resources—a one-stop shop for mobile learning! From great articles written by our experts, we collected the best info on gamification examples and techniques. Instructional designers, learn from Clare Dygert, our Manager of Instructional Design, to understand the key points before, during, and after writing your soft skills learning objectives. Hidden or unconscious bias is a hot topic within recruiting and management, but we haven’t heard a lot about how it affects training. Yet for training to be effective, it needs to be inclusive and to avoid “turning off” some or all of your audience. If you are creating a learning solution, learn how to avoid the hidden bias and facilitate true change. At the beginning of 2016, we published our picks for instructional design trends of the year. Be sure to follow our social media, because soon we will publish our predictions for trends in 2017! Read more: 2016 Instructional Design Trends Compass: Experiences, Ecosystems, Evaluations. Oh My! SweetRush’s other important offering is staffing temporary talent to support learning and development. We help our clients build the right teams and get the right temporary help because we do this work for ourselves! In 2016, we offered some great advice for professionals seeking temporary team members. 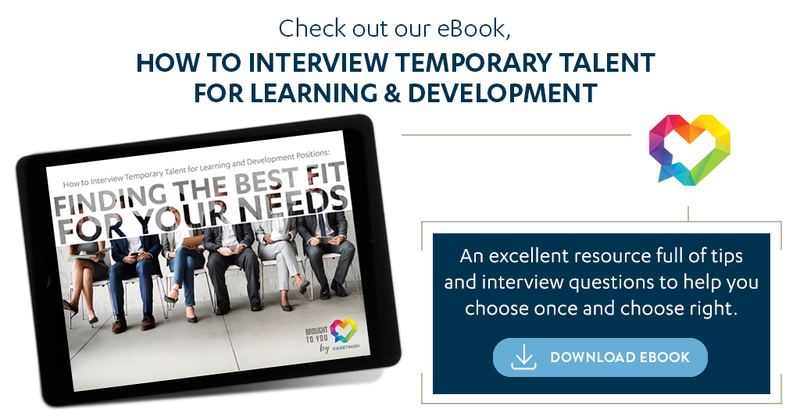 eBook: Interviewing best practices for temporary talent! Last year, we launched a new ebook for learning and development professionals. If you have not downloaded it yet, don’t wait another second! Learn from our experts how to make the right hiring decision for temporary talent. Be sure to hire the perfect talent by using samples and tests during the interviewing process to assess skills. What questions should temporary learning and development talent be able to answer? If you need to fill a position with temporary talent, be sure to ask the five interview questions this article highlights and think about what answers you are looking for to find the right fit. If the new year brings you the challenge of hiring new talent for a temporary position, this blog post is the read you need to decide whether to go DIY or use a staffing vendor. Read more: Recruiting Temporary Learning and Development Talent: DIY or Staffing Vendor—What Makes Sense? End the war for talent! Do your recruiting efforts feel like a fight for the best talent? If yes, think about changing your strategy. Become a company where employees want to stay, with a vibrant culture and opportunities for growth and advancement. Let’s wage peace in 2017! Respect, caring, fairness, and commitment are strong values in the SweetRush culture. We created these posts and articles in 2016 to share some of our lessons learned with professionals who are interested in shaping their business through culture and values. A challenge facing many industries is attracting and retaining Millennial talent. In this in-depth article, our CEO, Andrei Hedstrom, illuminates the importance of developing a values-based culture to retain and foster the best and the brightest of this generation. Having the opportunity to work with the same clients year after year is a source of pride for all of us at SweetRush. This post, featuring contributions from our project managers, offers some reasons why we inspire confidence in our clients. Read more: How Does SweetRush Inspire Confidence in Our Clients? Procedural justice is more than a legal concept. When it’s used in the workplace, it is exemplified by one word: fairness. Learn how we apply this concept at SweetRush to create a culture of respect and excellent client experiences. Productivity and effectiveness are popular topics at SweetRush. In 2016, we sponsored internal webinars on time management and email organization. We share tools and tips for productivity with our external community too! From time to time, we get inspired to share a tool review, like the one below from our Director of Engineering, Misha Milshtein. If one of your goals for this year is to be more organized, consider implementing a password manager. After reading this blog, you will understand why password managers are important and how using one can improve your daily work and help you be more efficient! Thanks for taking a look at our top learning and development blog posts, articles, and eBooks for 2016. Wishing you a very happy, productive, and outstanding 2017! 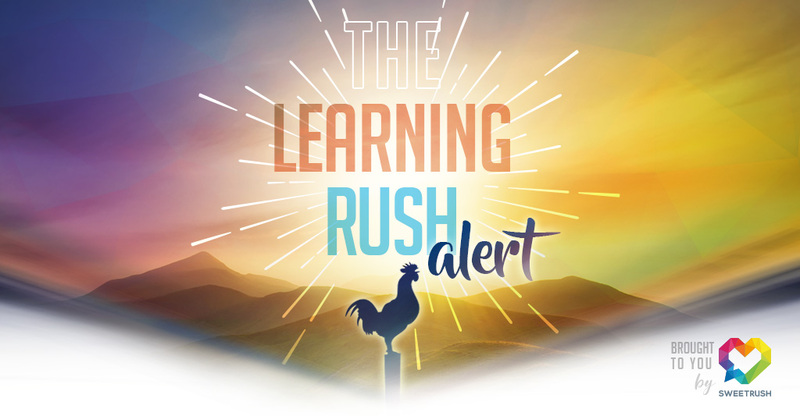 We’re gearing up to publish more great learning articles this year, on topics such as 2017 trends, gamification and mobile learning, hiring temporary talent, and culture and values. Be sure to follow us on social media so you don’t miss a thing!